Al Mansoori and Bin Mejren signing the agreement. 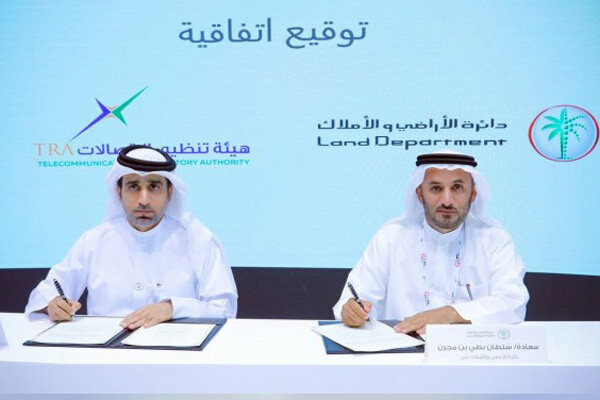 The Dubai Land Department (DLD) said it has signed an agreement with the Telecommunications Regulatory Authority (TRA) to regulate real estate advertisements by setting an operational framework in the control departments, thus reducing misleading real estate advertisements. The MoU was signed on the sidelines of the Gitex Technology Week in Dubai. DLD, through the Real Estate Regulatory Authority (Rera), regularly issues official circulars addressed to all real estate companies and institutions operating in Dubai. Through these memos, Rera had called upon all real estate companies and institutions keen on advertising any property located within and outside the emirate to apply for a permit through Trakheesi system on DLD’s website. Sultan Butti bin Mejren, the director-general of DLD, said through this tie-up, it looked forward to unifying and regulating the advertisement procedure for real estate companies and their use of text messaging and communications services to avoid public inconvenience. "It will assist us in eliminating unlicensed advertisements on social media and websites that promote real estate or leasing, both inside and outside the country," he noted. Bin Mejren said the MoU includes the regulation of electronic advertising, especially for websites that offer real estate; the exchange of information; coordination on unauthorised advertisements that are in violation of laws and regulations; and the mechanism of blocking these websites should they not modify the violating advertisements or comply with the laws set in place. Hamad Obaid Al Mansoori, the director-general of the TRA, said: "The authority greatly values the efforts of the DLD and its role in serving the national economy through the efficient management of the real estate sector, which is a vital segment of the national economy." "We also appreciate the department’s other activities in the development of laws and regulations relating to real estate advertisements on the internet and its work to preserve the interests of all involved parties," noted Al Mansoori.